Over time, fuel injectors develop a build-up of varnish and carbon. Periodic professional cleaning of the injectors will help to maintain engine performance and maximize fuel mileage. Ready to ship your injectors for servicing? Please e-mail me to schedule an appointment and include the word "injectors" in the subject line. Please click here to complete the injector information form. My mailing address will appear at the top of the completed form. Please visit my Frequently Asked Questions section for answers to common questions. To view your test results, please click here. Flow Test Only, no parts replaced or cleaning............$7.50 per injector + actual return shipping. 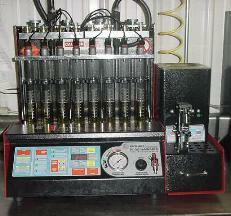 Complete Flow Test and Cleaning.............................$20.00 per injector + actual return shipping. Replacement hoses for hose end injectors..................$4 per injector. 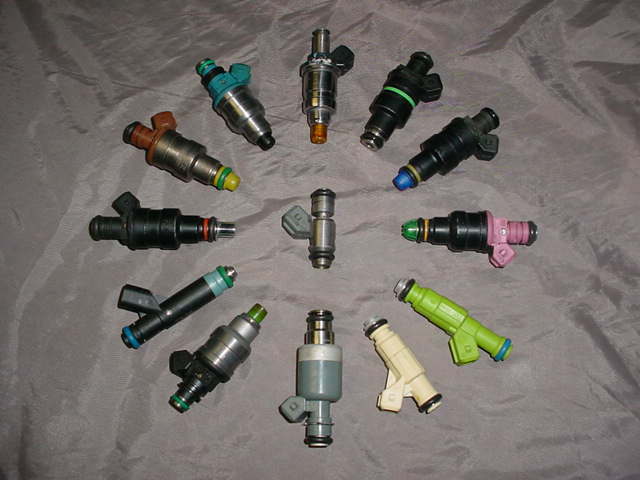 All prices are for top-feed electronic style injectors only (as pictured above). NOTE: Injectors are delicate pieces of equipment. They can be damaged by improper removal and/or installation techniques. Be sure to follow your particular manufacturer's installation guidelines when removing or installing your injectors. For more information, e-mail [email protected] or call (231) 796-5705. Ultra-sonic cleaning of injectors. Flow testing of injectors on the New Age machine. Click here to return to the Cruzin Performance homepage.